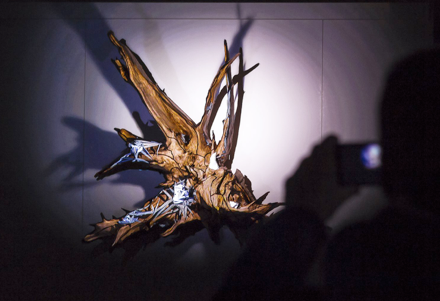 RADIX is a wooden root sculpture augmented by projection and sound. The sculpture is brought to life as a fictional entity: part organism, part apparatus. In an ongoing play of light and sound the object undergoes a metamorphosis from its initial natural shape towards a technical formation while the two aspects strive for dominance. 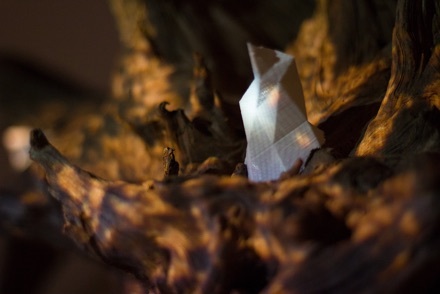 The project questions the relation between nature and technology and their connections and dependencies. The project questions the relation between nature and technology and explores the dichotomy between organic structures and digital aesthetics. The combination of traditional biological elements and latest digital projection technology opens a completely new field of augmented sculptural objects. It creates a surreal appearance that blurs the boundaries between the real and the virtual. Radix was produced by the interdisciplinary collective for audio-visual art Xenorama based in Potsdam, Germany. 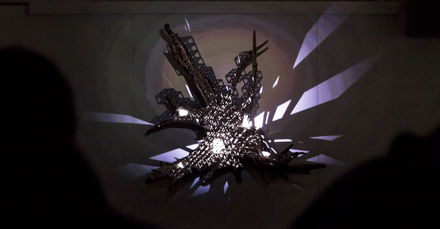 It was developed as an internal research project about the potential of organic surfaces, materials and shapes augmented with a digital layer of projected light, aesthetics and behaviors. 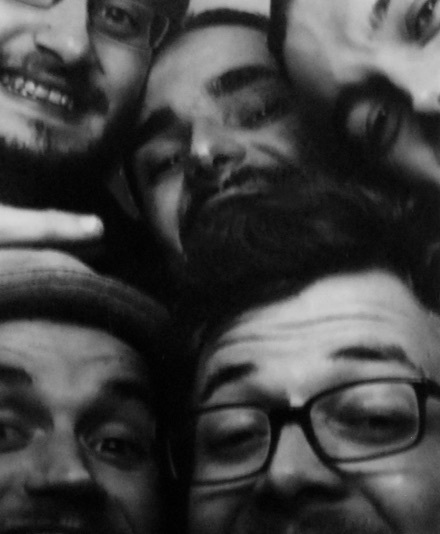 Xenorama consist of a core team of five members that combine expertise in the fields of design, animation, programming, sound design and composition and specialize in immersive experiences, interactive installations and light projection shows. Their projects won several national and international awards, were exhibited worldwide and published on various websites, magazines and books. Xenorama is an interdisciplinary collective for audio-visual art that consists of Marcel Bückner, Tim Heinze, Richard Oeckel, Lorenz Potthast and Moritz Richartz. Since 2014 we are based in Potsdam, Germany but nevertheless feel home and well connected in many other places. We are united by the fascination to use technology to create magic. We combine expertise in the fields of design, animation, programming, sound design and composition and specialize in immersive experiences, interactive installations and light projection shows. Our projects won several national and international awards, including the Micromapping and Audience Award at International Mapping Festival Girona, Shortlist at LUMEN Prize London, the Genius Loci Mapping Festival award and the ZKM Schlosslichtspiele BestOf Selection. Our works were shown amongst others in Germany, Denmark, Italy, USA, South Africa, India, Tunisia and published in several magazines and books. As an engineer and media artist Marcel Bückner uses new media technologies to question the perception of reality. He is interested in spatial cinema and site specific narration as well as in new forms of human-computer interaction. Having grown up in Berlin and Potsdam after numerous travels he studied Media Engineering in Düsseldorf with main emphasis on Virtual Reality and Interactive Visualization. Currently he is studying for the Master in Creative Technologies at the Film University Babelsberg Konrad Wolf. Interdisciplinarily-orientated he has realized short films, video installations and interactive applications. With Xenorama he works on media art installations and explores new ways to convey the narrative elements of film away from the cinema screen into the urban area. Grew up in Berlin, Potsdam and London and has been cultivating the fields of sound art, acoustics, painting, calligraphy and 2D-design as well the programming of interactive audio systems as an interdisciplinary artist since 2000. His areas of expertise in sound shaping and musical compositions have been influenced by the training in North Indian classical Sitar — among other instruments — under the late Pundit Amarnath Mishra in Varanasi. Parallel to his artistic activity in numerous constellations in Berlin and Potsdam Tim works in the areas of psychoeducation and social reintegration in a psychiatric clinic. Is a media artist with a design background, technological interest and cultural empathy. On the one hand he uses the possibilities of Digital Media as a new way of playful, artistic expression while on the other hand he investigates the implications of a transforming digitalized and globalized world through critical research and analysis. Lorenz studied Integrated Design at the University of Arts in Bremen and Interaction Design at IUAV Venice. He is a co-funding member of Xenorama. In between he worked for one year as Multimedia Centre Coordinator in Durban, South Africa and initiated MEET YOUR NEIGHBOURS, a platform for intercultural exchange with refugees. Currently he is writing his Master Thesis "Screenization - On the Diffusion of Digital Screens" in the Digital Media Program at the HfK Bremen. Lorenz' projects have been internationally exhibited and repeatedly honored. began piano playing at the age of six. Henceforth he would further develop his skills in Jazz Piano, composition, music theory and arrangement under the great masters Milan Šamko, Reggie Moore, Mack Goldsbury and Tim Sund. At an early age he could participate in courses at the famous Hanns-Eisler-Institute of the UdK Berlin and was awarded the soloist prize »Jugend Jazzt« among others. In various bands and projects he plays an active part in Potsdam's and Berlin's music and studio scene. Apart from his life as musician Richard studies Physical Engineering, specializing in Technical Acoustics and Fluid System Dynamics, at the TU Berlin. He scientifically investigates the development and effect of sound in different surroundings and explores new ways to perfect the auditory experience as well as acoustics in the context of sonic flow. is an artist and designer. Since his childhood in Bogotá and later in Rio De Janeiro, New York, Istanbul and Cologne he develops methods to visualize and experience the topics of time, space and man in the context of current art and media. With sensitivity for the contextualization of technology and art he develops new mapping and interaction systems as Creative Director at LichtZeitRaumKlang. He learned to structure and realize his passion for art and design under various mentors such as Jürgen Waller, Ekmel Ertan, Frieder Nake, Onur Yazıcıgil, Can Altay and Murat Germen. His multimedia works have been exhibited internationally.